The undead come in many forms; zombies, vampires, ghosts, and in the case of Corpse Princess (Shikabane Hime), there are shikabane (corpses) and shikabane hime (corpse princesses). A person may become such a creature if they die with a strong enough regret or obsession. The difference separating shikabane hime from shikabane is that the former is bound to a "contracted monk" and tasked with destroying the latter. It could just be me, but I expect undead creatures to seem undead: rotten flesh, loss of higher brain function, an insatiable bloodlust; at the very least, they should be somewhat socially awkward. shikabane come off as little more than generic monsters; more humorous than horrifying. shikabane hime, on the other hand, are cute girls with weapons and tattered clothing. While the series makes almost constant mention of these beings as "defiled" it doesn't quite convey that notion too well - on the bright side they don't sparkle. Corpse Princess really falls flat on the horror-front: it all but entirely lacks the atmosphere, tension, and overall mood that is a staple for anything associated with the genre. Occasionally the show does get it right, but it seemingly has no clue how to proceed once it does. Many of the earlier episodes feature a great horror-esque setup (episode 3, "Voice of the Night", and episode 9, "Set Your Heart Aflutter", come to mind specifically), which unfortunately are never capitalized on or are otherwise destroyed by a giant chicken. I wasn't expecting Boogiepop Phantom here, but a touch of Hellsing couldn't have hurt, or even a pinch of High School of the Dead for that matter. ... the reason I've made such a big deal of the show's horror aspect is because Corpse Princess is about as ho-hum as an action series can possibly be. The story follows a young, orphan boy, Ouri Kagami. One dark and spooky night he stumbles across the lifeless corpse of a young girl. What happens next will change Ouri's life forever: He witnesses the girl coming back to life. Intrigued, Ouri now finds himself in a dark and secret world filled with shikabane. While familiar, the story isn't bad. Predictable? Yes. However, there are enough twists and sub-plots along the way that it still works quite well. You'll likely figure out the twists in advance without too much thought, oddly enough, this doesn't undermine them. A point that deserves mentioning is that Corpse Princess answers just about every question the viewer might have, more importantly, these answers actually make sense within the constructs of the series. The only major lingering question that remains: "why hasn't the entire world become overrun with shikabane?" Let's face it; dying with intense regrets isn't exactly stringent criteria. The drama is kind of a mess. Any dramatic prowess which may exist is greatly compromised by awful dialog. In the first series this was more or less limited to a few banal one-liners. However, in the second series we are subjected to a near constant barrage of characters projecting their feelings via monologue. These expositions are vulgar, repetitious, and worse yet, utterly unnecessary. Corpse Princess does a great job of subtly making us aware of a character's sentiments without the need for incessant droning, and yet it drones on anyway. The biggest letdown of the series is also the best thing it has going for it: the flashbacks. We are given brief glimpses into richer, more interesting tales. One can't help but long for more of "then" and less of "now". The OVA, Even So, As a Person (episode 26 in the collection), is dedicated entirely to one such backstory; it is easily one of the show's best episodes. I can't help but feel that if Corpse Princess were made in a similar vein to Baccano! it could have been amazing. Rather than focusing on just the two lead roles and overextending their stories, shift focus amongst various other characters and bring it all together towards the end. I can't imagine anyone who has seen the series would think more Sadahiro Mibu or Akasha Shishidou could be a bad thing. From a production standpoint, I expected a bit more of Gainax, especially when it came to the visual style. While well done, it lacked that Gainax flair, leaving me to wonder how much work they actually did for the show. 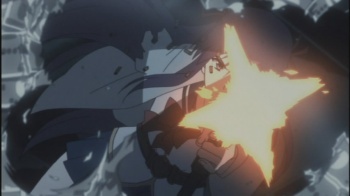 The animation quality tends to fluctuate, but generally is strong during action scenes. The dubs are painful, making the previously mentioned dialog all the worse. The Japanese audio doesn't seem much better, but is probably less grating on the ears for those of us who don't speak the language. Bottom Line: Corpse Princess falls short in terms of horror and is only moderately successful in the action realm. Awful dialog makes the series much less enjoyable than it could have been. Recommendation: It's streaming on Hulu, so if you're bored you've really got nothing to lose. Though, I wouldn't recommend anyone going out of their way to watch this, there's better stuff out there. Salvan Bonaminio eagerly anticipates being hunted by crazed, half-naked, zombie girls as soon as he becomes undead.